Before reading any further close your eyes and picture a normal fruit. I had the pleasure to try the Brasilian “goiabada” today. Goiabada is like sweet jelly, hard enough that one has to cut it with a knife. It is made of guava fruit (or goiaba in Portuguese). It has a skin and flesh with some seeds inside. The normal way to eat it is to take the fruit, break the fruit or cut the skin and eat what is inside. In order to find out what a guava is and how to eat it it took me several probing questions to João who probably thought why all these stupid questions as “guava is like any other normal fruit”. Now, it is obvious that normal things mean totally different things to different people. Wonderful! This discussion raised another question in my head – Why do the southern fruits seem to be hidden under a skin or peel (think guavas, papayas, mangos, oranges, avocado, melons, etc, etc) whilst fruits in the northern climate you can just eat without needing to peel them? My theory is that in the north the fruit is yearning for the little sunshine and warmth it gets to become all juicy and sweet in a limited time and in the south the fruit has to protect itself from the heat not to dry out. I wonder what a “normal fruit” would be for different people. 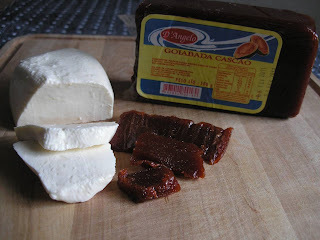 PS - Cheese (especially Minas cheese) and goiabada go hand in hand in Brasil just like Romeo and Juliette, a clown and the circus, love and kiss ... Listen to Adriana Calcanhotto "Fico assim sem voce" that talks about how one part of the couple feels without the other. I can say that the goiabada tastes good also with other types of cheese. In Spain a typical marmelada, I believe it is made out of quince, is eaten with a white Burgos cheese - also delicious.